The coloured engraving above is a view taken from the hill overlooking Darby Street in the current suburb of Cooks Hill, Newcastle. Features include: St John’s Anglican Church, (between Darby Street and Dawson Street), directly behind is a train on the Newcastle Coal Company’s Railway, (running along Bruce Street and curving towards Dawson Street), a train running along the Australian Agricultural Coal Company’s Railway, to the extreme right of the engraving can also be seen a train on the Great Northern Railway. Various buildings can be seen along Darby Street and (probably) Laman Street. In the distance is the area around Parry Street and Union, where reports of discoveries of Aboriginal burials were reported in 1881. 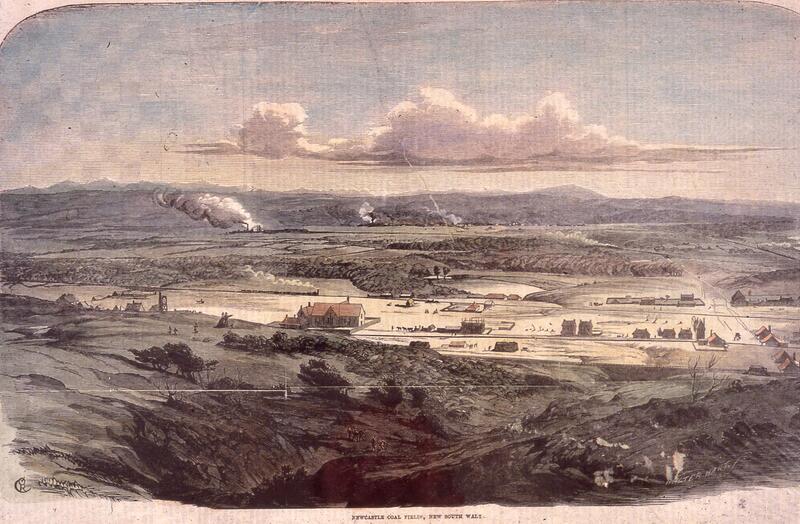 The Newcastle Coal Fields, New South Wales. Of the mineralogical treasures of New South Wales its carboniferous deposits are by far the most extensive, if not the most valuable, and present a source of wealth in developing other industries which must help to advance our national prosperity. 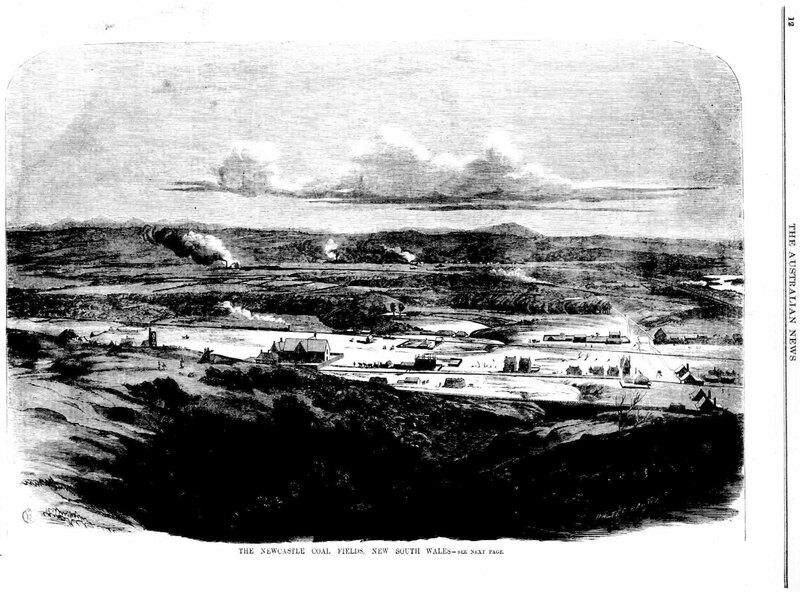 Coal beds are to be found throughout almost every part of the, colony; but by far the most important fields are those situated on the south bank of the Hunter River, or, as they are commonly termed, the Newcastle mines, which are of almost unlimited extent. Commencing at the southern entrance of the harbor, where the coal is distinctly visible in the sea face of the cliffs, unbroken strata extend inland for about nine miles, and south ward as far as Lake Macquarie. There are at present eight mines in active operation; of these, the Australian Agricultural Company is the oldest. This company obtained a free grant of one million acres from the Crown, in 1824; selected it in the Hunter River district, found coal upon a portion of it, and at once made use of the convict labor which their charter assigned to them, in testing how far the discovery was likely to be profitable. 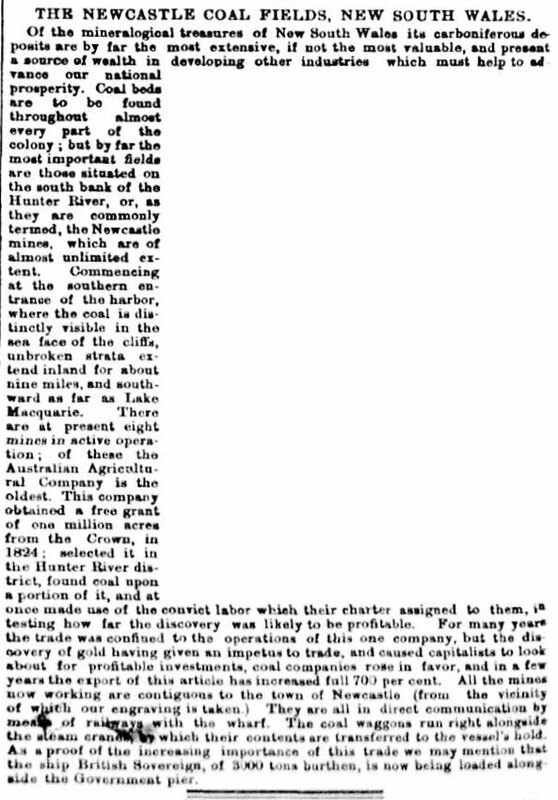 For many years the trade was confined to the operations of this one company, but the discovery of gold having given an impetus to trade, and caused capitalists to look about for profitable investments, coal companies rose in favor, and in a few years the export of this article has increased full 700 per cent. All the mines now working are contiguous to the town of Newcastle (from the vicinity of which our engraving is taken.) They are all in direct communication by means of railways with the wharf. The coal waggons run right alongside the steam cranes by which their contents are transferred to the vessel’s hold. As a proof of the increasing importance of this trade we may mention that the ship British Sovereign, of 3000 tons burthen, is now being loaded alongside the Government pier. We sincerely thank the State Library of Victoria that were able to provide the following details regarding the original black and white engraving. Description: print : wood engraving. Wood engraving published in The Australian News for Home Readers. Engraved in image l.r. : Walter Hart. Monogram of Oswald Campbell engraved in image l.l. Contents/Summary: Shows view overlooking Newcastle, railway lines and buildings in middle distance while factories? belch smoke in distance. The caption in the attachment states it’s from the “Australian News for Home Readers”, 25 August, 1865. My copy is identical and uncoloured. Gionni’s copy has been chopped off a little on the RHS. Interestingly, mine is from “The Illustrated Sydney News”, and a different date, 16 August, 1865 (page 8). Very interesting. I checked the story on the Cawarra wreck in the Australian News, and the engraving is different to the one in the Illustrated Sydney News. Both artist and engraver were Melbourne based, and so was the Australian News. It’s always thrilling to see Newcastle pop up in various places, but I would like to know more about the connections between both publications.